Without the Bay Area thrash scene of the mid-to-late '80s, heavy metal wouldn't be what it is today. Back when MTV and Sunset Strip-flavored hard rock ruled the airwaves, a small yet dedicated community of San Franciscan metalheads helped ignite a musical scene that would eventually influence a generation of musicians throughout the world. Locals Exodus and Los Angeles transplants Metallica reigned in small clubs like the Old Waldorf and The Stone, while thrash metal upstarts Slayer and Megadeth found a second home in the Bay Area. Testament, Possessed, Death Angel, Heathen, and Vio-lence, also helped put the Bay Area thrash scene on the lips of metal fans from Albany to Algeria. Photographers Brian Lew and Harald Oimoen were insiders in the tightknit '80s Bay Area thrash scene, and their photograph collections from the time period are pure gold. Last month, the photographers released 'Murder in the Front Row: Shots From the Bay Area Thrash Metal Epicenter,' a stunning book that collects over 400 color and black and white photos, plus personal accounts by members of bands such as Machine Head, Testament and Exodus. In this Noisecreep exclusive, Lew picked three of his favorite photos from the new book and gave us the story behind each. Check out the vintage shots of Metallica and Slayer below. 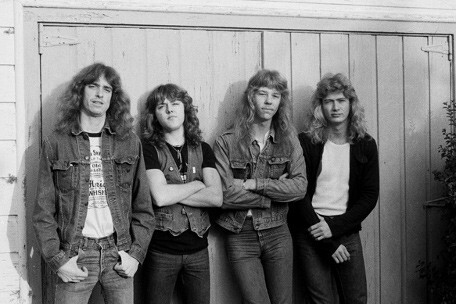 "They look awkward and uncomfortable; they're leaning against THE garage where Metallica would work on the songs that became 'Kill 'Em All,' 'Ride the Lightning,' and 'Master of Puppets.' After taking these "posed" pics we went inside where the band had set up their equipment in the living room of the house; six of us had been invited to attend as Metallica rehearsed with Cliff for the first time. This photo basically shows Cliff's first day as a member Metallica." "This was from Cliff's first show with Metallica. It looks like they've been brothers forever, but this was the first time they had ever played together onstage. Cliff's first rehearsal with Metallica had been less than three months earlier." "Slayer had played their first-ever Bay Area show three days earlier at The Keystone Berkeley where they went onstage wearing eyeliner. We waved paper towels from the bathroom at them and chanted "Take off the makeup!". The next night they played Ruthie's Inn in Berkeley with Exodus for the first time and the makeup was gone. This photo was taken at the next show which was their first show in San Francisco. Slayer look like newbies next to Exodus; Slayer with their new leather jackets and Exodus with their tattered t-shirts and ragged denim vests. Exodus were the heart and soul of the original Bay Area metal scene. In the very beginning Slayer and Megadeth would come up to the Bay Area and spend five days playing shows; they would basically become a local band while they were here because they fit in with us so well." 'Murder in the Front Row: Shots From the Bay Area Thrash Metal Epicenter' is available now via Bazillion Points.